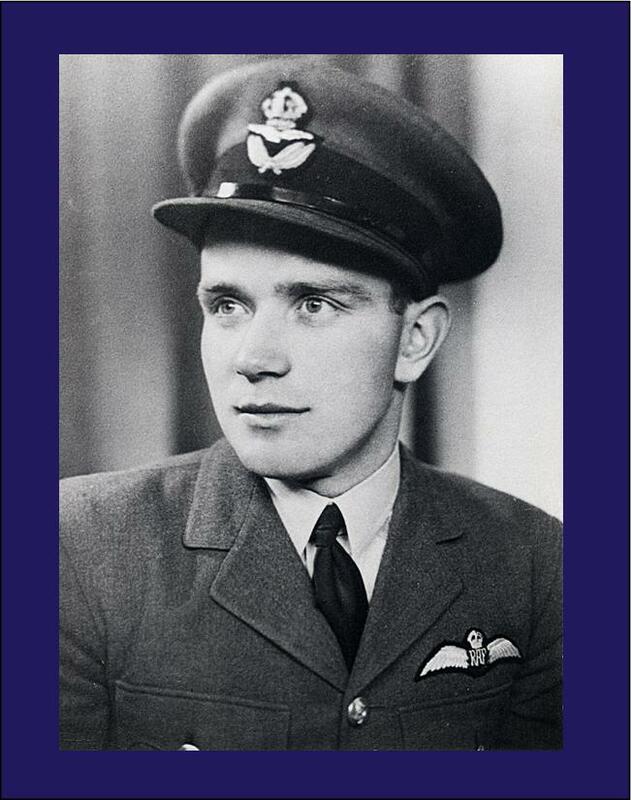 In this the 70th anniversary year of the Battle of Britain, I have decided to write this memoriam to my father as I thought that after all the years that various people have written what I regard as a lot of ‘fairy tails’ about Hugh, it would make sense to try and put the record straight. In my eyes Hugh was a very brave Canadian to come to England to help our forces win the War and give his life in so doing. To see that some authors have written that he acted illegally is downright disgusting. I have decided that the best course of action is to publish the facts as I know them. I should mention that I have not been approached by any author to provide the information which I have laid out below. Born: Victoria Hospital, London Ontario, Canada. Father: Hugh William Reilly (note the missing "e" before the "y"). Parents married: Hamilton Ontario, Canada 25th. October 1916. Annie - Aim Pier, Fraserburgh, Scotland. (aged 23 at wedding - born 1893). The above details appear on Hugh Reilley's Birth Certificate that also give the family's address as 960 Cass Ave., Detroit, USA. It is assumed that Annie decided to move back to London Ontario to give birth to Hugh in order to be near her Brother's family. 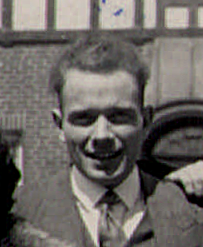 Not long after Hugh's birth they went back to live in Detroit but returned to London again in 1928/9 to live at 20 MacKinnon Place, South London. At about that time Hugh (senior) and Annie separated and he returned to Detroit. (Exact dates are not known but it is thought that Hugh must have spent no more than about 9 years with his parents in America). There is no further information known about Hugh (senior). He is now presumed dead. Annie died 25th. May 1930. After Annie died Hugh was brought up by his uncle, John Miller (brother to Annie) and his wife Rosina Anthea Musgrave Miller (nea Clarke) in London Ontario until 1939. Education: Prior to 1933 he was at The Tecumseh Public School. Interests: Most sports, but especially Rugby (American football) and Tennis. Employment: Between 1938/9 he worked at the Highland Golf Club, probably as a "Caddie" and also at the "Winery" (job type unknown) both in London Ontario. In May 1939 (age 21) he and his friend Bert Bucannan (an RAF Coastal Command Pilot killed in July 1940) left from Montreal bound for England to join the RAF. Hugh joined the RAF for training 20th. September 1939 and was given a short service Commission for 4 years as Acting Pilot Officer on probation in the General Duties Branch of the RAF Volunteer Reserve. His first letter to my mother was from No.1 Initial Training Wing, Jesus College, Cambridge on 22nd. September 1939.
Letters dated 30th. October, 15. November 1939 and 2nd. January 1940 were from the Bristol Flying School and No.10 E.F.T.S. Yatesbury, Caln, Wiltshire. Where he reported flying Tiger Moths.There is also a photograph showing him standing in front of a Harvard Trainer but no date is known. Hugh married my mother, Margery (usually called Molly) Etta Fleming whom he had met at a Ball given by Lord Beverbrook in London. His address at the time was No.2 F.T.S. Brize Norton, Oxfordshire. On the Marriage Certificate dated 20th. April 1940, he stated that his father was deceased but gave his occupation as a "Government Transport Inspector". On the 10th. August 1940 Hugh was graded as a pilot Officer on Probation. He was subsequently posted to 64 Squadron at Leaconfield, Yorks in early September and moved to 66 Squadron at Gravesend on the 15th. He is also reported to have served in 92 Squadron, but no further details are available for this part of his service. So from the date he joined an operational flying unit to the date he was shot down and killed would have been just over a month. From joining the RAF until his death was about 13 months. During his service he claimed a damaged Bf 109 on the 24th September (my birthday), a half kill of He. 111 bomber (with his wing leader Bobby Oxspring) on 26th. September 1940 and a kill of a Bf. 109 fighter on the 27th. September. Hugh was shot down by Major Werner Moulders, Kommodore JG51 (an Ace in his own right) over Westerham, Kent on October 17th. 1940 and crashed on Crockham Hill, Sevenoaks, Kent where his plane was found burnt out. He was buried with full RAF honours at Gravesend Cemetery. 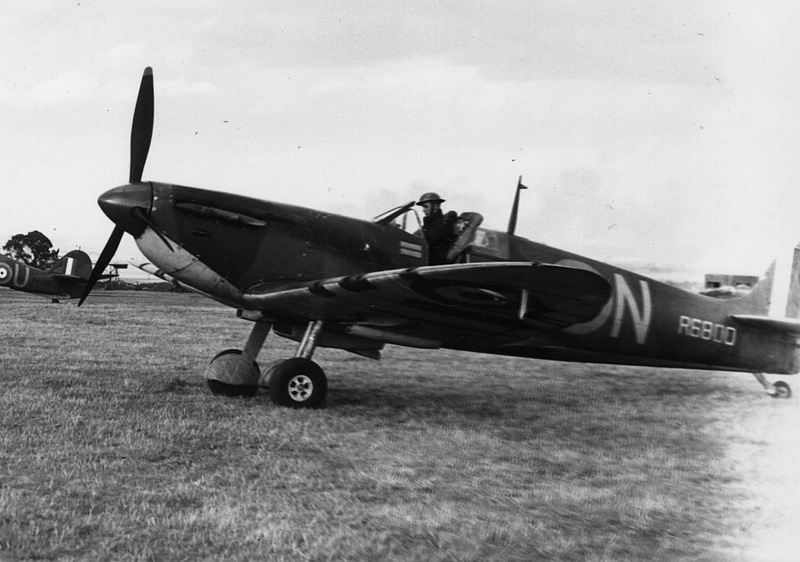 Hugh had been flying Spitfire R6800, normally used by Squadron Leader Rupert Leigh. Malicious and unsubstantiated statements have been made by a number of authors detailing my fathers’ life during the War which I regard as offensive. Several of these claim that Hugh was an American born in Detroit Michigan and that he illegally obtained a Canadian Passport in order to join the RAF. I have his Birth Certificate and he was born in London, Ontario, Canada. Although Hugh’s father was American, Hugh's birth was only registered at his Canadian Birthplace and there has never been any documentary evidence to support the suggestion that he was an American. The lack of scholarship shown by many authors is appalling and represents a great disservice to the memory of a young Battle of Britain pilot. Winston G. Ramsey - The Battle of Britain Then and Now. Published by After the Battle Magazine. The remaining relatives; my mother, her mother and a close friend - Michael Braden as well as my Cousin, Paul Miller all regarded him as a Canadian. All the people who have been able to offer information on Hugh's past before coming to the UK have been Canadians. Apart from the UK, the only other country to honour his bravery was the Canadian Government. Most of the involved and detailed research has been carried out by my cousin, Paul Miller of Grand Bend, London, Ontario, Canada to whom I am most indebted. I was born on the 24th. September 1940 (less than a month before his death) and I am not even sure that my father had seen me before he was killed, particularly as he appeared to have been rather busy around that date. Since late in 2015 when I was able to view footage taken at the Gravesend Airport during 1940 (the exact date is yet to be established), I have been involved with others in researching the names of the Pilots involved in this very interesting piece of film. I have concluded that the clip shown on the film footage from time frames 10:52:52:01 to 10:52:52:10 are of my father PO Hugh William Reilley being interviewed by the Intelligence Officer. 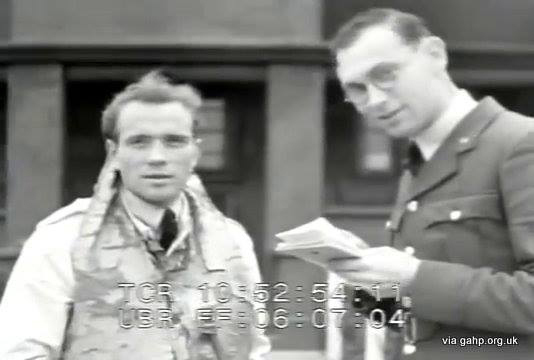 In this post, I have included a picture taken of him just before he departed from Canada in 1939 which shows a strong likeness and note that Hugh was one of the few Pilots to ware a white Flying Suite to help in his identification. viewed by following the YouTube link given below. The Gravesend Airport Facebook page has featured several pieces of correspondence relating to this subject for those that maybe interested. On the 21st September 2014 I realized a Christmas gift from our Son Alexander and his family for a flight alongside a Spitfire. A wonderful experience which I dedicated to my father Hugh. 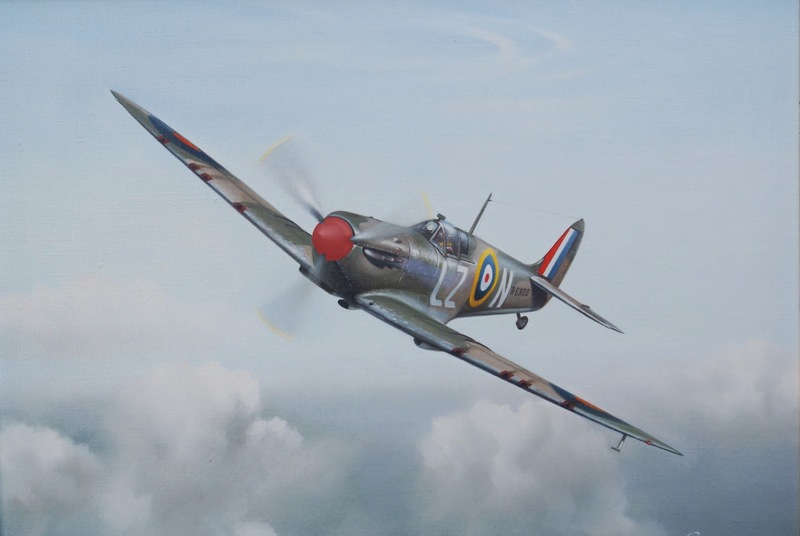 I am most grateful to Mr. Derek Marrable for his permission to show a copy of his painting of the Spitfire R6800 in which my father, PO Hugh Reilley was killed. Those who have followed this memoriam or read other information will know that this aircraft was actually used in the main by Squadron Leader Rupert Leigh. I have no idea why my father was using it, but assume his mount was out of commission at the time. One other notable thing about this aircraft (a Mark 1a) is the red propeller boss which must have been a requirement by the Squadron Leader. Winston Churchill visited the Gravesend Base. Notice the uncovered gun ports. Probably only just returned from a patrol. Chris Dickon and "The Foreign Burial of American War Dead"
In November 2010 Wally Fydenchuk, Author and researcher for the Book “Immigrants of War” and author of www.immigrantsofwar.blogspot.com passed on to me information regarding a book which he had come across titled “The Foreign Burial of American War Dead” - By Chris Dickon. He had been in touch with both the Author and publishers “McFarland Publishing” to point out the numerous inaccuracies there were in this work, including a reference to my father suggesting he was an American – as the title of the book suggests. These American-related casualties who fought with Commonwealth Forces in World War II are buried or memorialised in CWGC cemeteries in all parts of the world. The vast majority are American born, and a good number are American immigrants. Some were next of kin to American wives or parents, though not necessarily American citizens. This list is distilled, as given, from CWGC records. More complete information about origins, age, place and cause of death, related battle action, and next of kin can be found in the name search engine of the Commonwealth War Graves Commission Website. Reilley, Hugh William, Pilot Officer. As the reader can clearly see the heading again refers to “Americans”. Mr. Dickon admits that his source for the information which he used was taken from the “Commonwealth War Graves Commission Website” which again as I pointed out has since been updated after I complained about the reference to my Father being “born in Detroit, USA” and “one of the few Americans who took part in the Battle of Britain”. He agreed that the information had been updated. I am absolutely sure that my father made no such Oath of allegiance to the United Sates and I have challenged Mr. Dickon to produce the documentary proof, with no response. To make matters worse Mr.Dickon did not contact me directly in his research and refuses point blank to make any amendments to his book or any future printings thereof even though I made a personal request for these amendments to be made on behalf of my family and and our name before making this Blog entry. In an effort to try and get help from the Publishers, I contacted them directly:- The Publishers:- McFarland & Company, Inc.960 Nc Hwy 88 W Jefferson, NC 28640, United States. They have also refused to take any independent action in this case, other than referring the matter to the Author. There is no doubt in my mind that this book is a very poor research tool for anyone interested in this subject and the Author deserves every criticism for writing it and his unwillingness to correct the many errors. 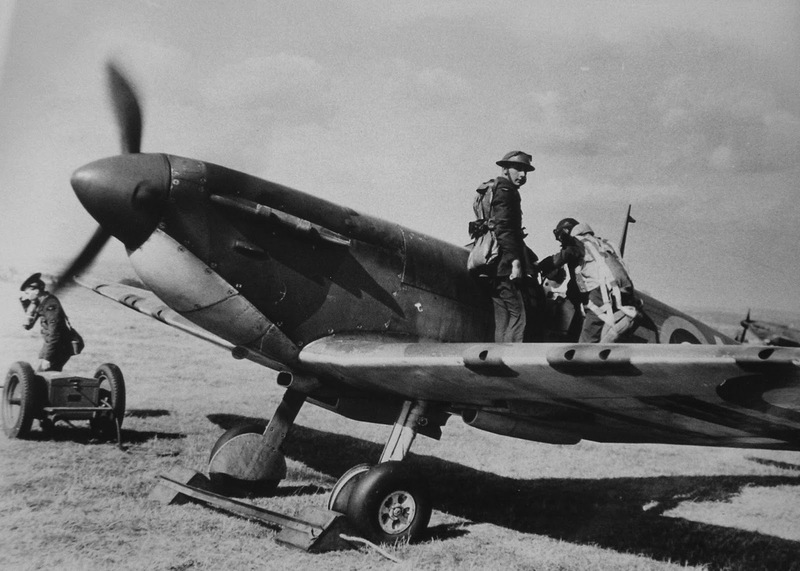 In essence another example of "The lack of scholarship shown by many authors is appalling and represents a great disservice to the memory of a young Battle of Britain pilot." Since this Memoriam was written, I have been in touch with the Commission to request the removal of the reference that was given to Hugh being an American and being born in Detroit U.S.A, neither of which are true. This information was apparently obtained from the book written by Winston G. Ramsey "The Battle of Britain Then and Now" who was made aware of this inaccuracy more than 28 years ago. As The Commonwealth War Graves Commission is highly regarded by Historians and enthusiast as a reliable source of accurate information, I am now pleased to see that this entry has been modified to show the truth regarding Pilot Officer Hugh William Reilley, a very brave Canadian who was killed fighting for our Country. Since this Memoriam was written, I have received an apology from Alex Kershaw for mistakes made in his book "The Few" regarding statements about Hugh's nationality and place of birth. He assures me that these will corrected on all future publicized work.